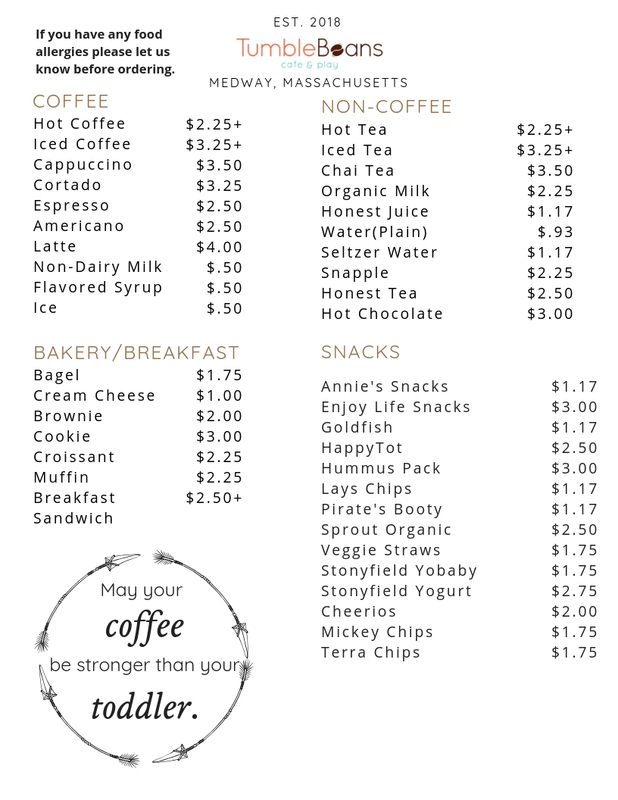 Tumble Beans Cafe & Play serves coffee, fresh-baked goods, and snacks all day long. We also have a breakfast menu and lunch menu displayed below. Tumble Beans Cafe & Play is 100% nut free and takes this very seriously. We don't allow outside food for one very important reason: We are a licensed food establishment and in order to adhere to Health Department guidelines, we must be responsible for all food consumed on our premises. As a result, we have to restrict the outside food allowed in to baby purees. We also have to be aware of children with allergies and intolerances and people often carry snacks like popcorn and nuts which are a major risk to small children.